The Wall Router's principal function is to serve as a Router in an XBee network. Routers repeat messages in the XBee mesh allowing the mesh to span a larger area. The Wall Router also has light and temperature sensors. The Wall Router Device has 3 output terminals providing light intensity and temperature information. The "light_Lux" output emits a number indicating the amount of light, in Lux, that is shining on the light sensor. The "temp_F" and "temp_C" outputs output the ambient temperature in Fahrenheit and Celsius. port_location: the port_location of whatever wired device the system owns in the network (usually a Coordinator's port_location). If there is only one XBee network for the system, this parameter can be set to nil. address: the 64 bit network address of the device. 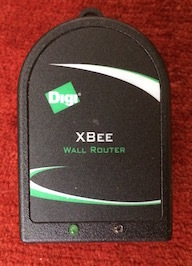 The network address uniquely identifies the XBee device. Typically, the address is found on a paper (serial number) label affixed to the device. It is also in the device's SH and SL registers, and it shows up in the return value from an AT ND (node detect) command. Network addresses are written in hex, are 16 characters long, and often look like "0013a200406b0263". To enter a network address as an address parameter, start with the 16 character network address, strip off any leading zeros, and append "0x" to the beginning. Note: the port_location parameter can be set to nil, if the system owns only one XBee network.